Few things please my palate more than a hot buttered homemade roll. I actually baked the ones you see here. 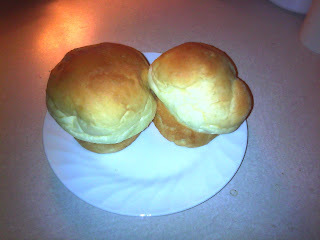 Next to Sister Schubert rolls they are my favorite. Scripture tells us that man does not live on bread alone, but this is one sister who believes she could! I love bread! But I also know that my body needs the nutrients that bread alone cannot supply, and so does my hungry soul. When we meditate or "feed on" Scripture, the truth of God's Word acts much like a vitamin, fortifying what we lack spiritually and boosting our spiritual immune system against sin, stress, and sorrow. While those things occur in each of our lives, a solid foundation of biblical truth can make us more effective in dealing with the stresses of everyday life which threaten our spiritual, emotional, and physical health. The following verses from Colossians 3 offer a lot of nutrition if we are willing to take them in and digest them a word or phrase at a time (that's meditation). "Let the peace of Christ rule in your hearts, since as members you were called to peace. And be thankful. Let the word of Christ dwell in you richly as you teach and admonish one another with all wisdom, and as you sing psalms, hymns, and spiritual songs with gratitude in your hearts to God" (vs. 15-16). As I read these verses this morning, God imparted the following insights. Let is a command which means allow or permit. It is a choice we make and a challenge to us to allow God's peace to rule in our hearts. Rule is a word which denotes dominion. When we allow God's peace to rule in our hearts, we give it dominion over stress and worry. Peace is that condition or state of well-being, rest, and satisfaction which is achieved by surrendering ourselves to God's will. Only when we cease our striving and allow God to have his way in our lives will we come to know his peace that transcends all understanding (Philippians 4:7). The word of Christ is God's Word, that collection of God-inspired writings we commonly refer to as the Bible. It is the life manual for the believer, our handbook for living in a fallen world. It is filled with God's unbreakable promises, his principles for godly living, and his assurances that he is unchanging, all-powerful, ever-present, loving, merciful, gracious, and good. When we "sing hymns, songs, and spiritual songs," we reinforce scriptural truth in our minds by verbalizing them to ourselves and others. Songs are a tremendous tool for memorizing and storing away in our hearts the very words of God. When we allow God's Word to dwell in us richly, we allow God himself to take up residency in our hearts with nothing held back from him. God's Word illumines the dark spaces so that we can clean out the lesser things and replace them with God's greater things for us. Sometimes we are called on to teach others what we have learned, and often we learn best by teaching. God's truths are meant to be not only learned and lived, but also shared with others, that they, too, might receive encouragement and hope in their time of need. It is not enough to learn God's truths from others. We must make spending time in God's Word a personal priority. We each must take our daily vitamin for the soul, one verse or chapter at a time. Open the Book...it will do you good! Please visit http://www.thechristianauthorsshow.com/ TODAY (9/29) and listen to my interview regarding Good to the Last Drop: Refreshin Inspiration for Homeschool Moms and Other Busy Women. If you have been remotely curious about the book or have wanted to know more about my background, this is a very informative interview. Please share this information with a friend so they can listen, too. 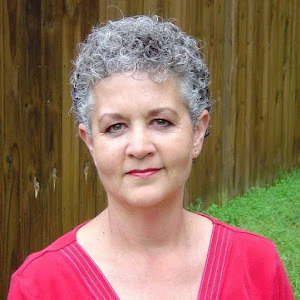 Please also take time to visit my website, http://www.deedeewike.com/, to learn more about my speaking and writing ministry and to sign up for my free email newsletter. Lately I have been struggling with my faith and allowing circumstances to shake me when I should be unshakable because of God's promises in his Word. This is especially true in the area of finances. When something happens -- such as the recent breakdown of my husband's car and the expensive repairs required to fix it -- I am quick to call into question God's provision and direction in my life. What was that all about anyway? As tight as money is, why did it have to happen to us? These are questions we all ask ourselves at times, and the only way we can have peace is to have blind faith, the kind of faith that believes God will hold true to his promises even when we can't see how he will provide. But what happens when we begin to question God's plan for our lives altogether? Recently I sensed God calling me into ministry as an author and speaker, even though I couldn't see his provision for that ministry. I sent a newsletter to my friends and family, asking not only for their prayer support but financial support as well, if God so led them, so that I could be positioned to go wherever God called me to minister. Does the lack of financial means to conduct ministry mean that I misunderstood God's call in the first place, or is he planning to provide for the needs of my family and ministry another way, such as through full-time employment in the workplace? The passion in my heart, to share his Good News and encourage others, is consistent with his Word. I have seen him work in and through me. But who am I to expect God to provide for our needs in a particular manner? Have I forgotten that he is God and I am not? Many of us encounter those moments on our journey when we question God's methods and our own relationship with him. If we have not received what we have prayed for in a reasonable amount of time -- something which clearly God is able to do, but may choose not to -- then perhaps we have considered ourselves not quite good enough to merit his favorable response to our prayer. Have we ever considered that his "no" could lead to a greater "yes" for us? Dare we imagine that "no eye has seen, no ear has heard, no mind has conceived what God has prepared for those who love him" (1 Corinthians 2:9)? How is your faith today? Have you opened the hood of your heart to see if it has been adequately filled with his Holy Spirit? Have you taken in enough Living Water to make sure you don't boil over when life's circumstances leave you running a little hot? As with a car, a little routine maintenance goes a long way to ensure that your spirit is road ready and your faith is strong enough to take you anywhere God leads. If you feel less than prepared for the journey God has chosen for you, then spend a few minutes in his Word and in prayer each day and ask God for a fresh filling of his Holy Spirit to guide you and give you grace for living. Then trust him to get you safely to your destination, even when you can't see through the fog of everyday circumstances. God will never change. His promises will never be broken. When you can't see his hand, trust his heart. All things work for our good though sometimes we can’t see how they could. Struggles that break our hearts in two sometimes blind us to the truth. Our Father knows what’s best for us; His ways are not our own. God is too wise to be mistaken. God is too good to be unkind. When you can’t trace His hand, trust His heart. He sees the Master plan. He holds the future in His hands. So don’t live as those who have no hope. All our hope is found in Him. We see the present clearly, but He sees the first and the last. And like a tapestry, He’s weaving you and me to someday be just like Him. 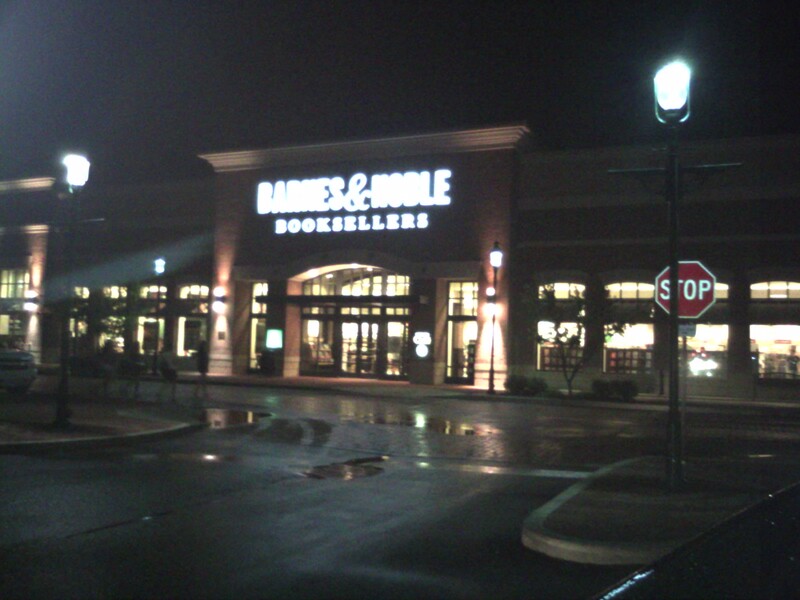 Road Trip -- Barnes and Noble! This weekend Joy and I had our first book signing at a Barnes and Noble. Just the thought of it still excites me -- what fun we had! Thanks to all of you who prayed for our safety and success -- God was truly faithful and even blessed us with a gorgeous sunset on our return drive home. After a harried day on Friday because of my husband's car problems, we departed for Hendersonville a little behind schedule. Upon our arrival in Hendersonville, we opted to find the store before checking into the hotel. Although these cellphone camera pictures don't do it justice, the store was beautiful and the window display quite lovely. 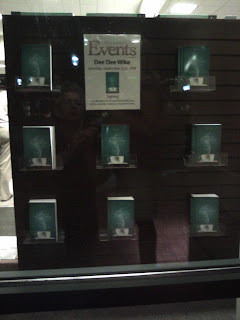 I had hoped to snap a shot of the window display in the daylight on Saturday, but the books had been removed and set up for the signing. After visiting the bookstore, we headed to our hotel which was located, in all places, behind a Hooters! When I booked the hotel online using my hotel membership card, the pictures didn't tell the whole story. Buyer beware! You get what you pay for. The room may have been cheap, but the look on Joy's face when we pulled up to the hotel and walked inside was priceless! Poor thing! She just thought the Red Roof Inn we stayed in on another occasion was bad! The lobby and hotel room were tiny, and the clearance between the foot of the bed and the television was no more than twelve inches. Still, the room was clean and at the end of the day, we were thankful for a comfortable bed. Make no mistake, though, we were up and out of there as early as we could manage it, and headed to the nearest Cracker Barrel for a GOOD breakfast! Eating at Cracker Barrel was a first for Joy and a nice treat for both of us. After filling our tummies with such delicious comfort food, we headed to Rivergate Mall, which is currently undergoing renovations. Since we had some time to kill before the book signing, we decided a little shopping was in order. Good thing, too, because we discovered that the blouse I had taken to wear for the book signing had a rip in it. I found one I liked even better at Cato. With great anticipation we headed to Barnes and Noble, where we were warmly received by Christine, the assistant store manager, and her associates. Although we were only scheduled for a two-hour signing, I'd have stayed longer if time allowed. Although I was fortunate to be able to sell and sign a few books, the bigger blessing was visiting with old friends and meeting new ones. 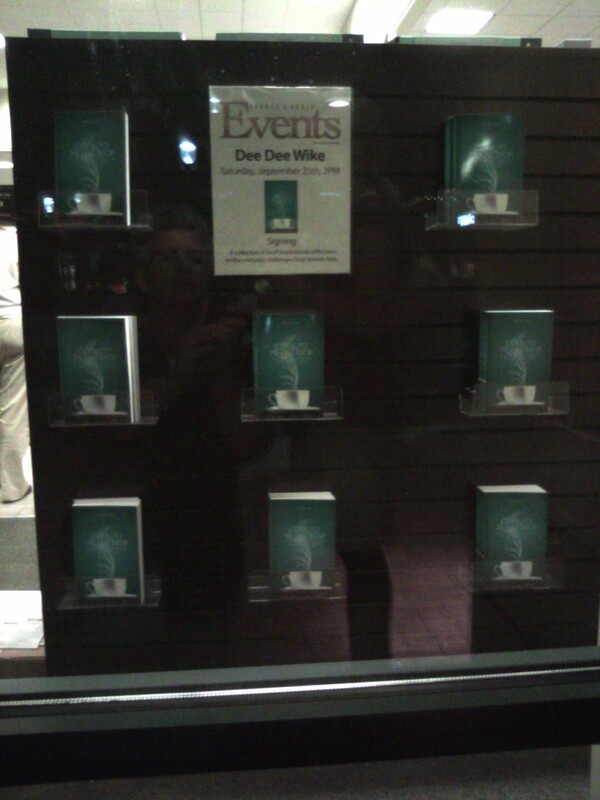 Although I hate having my picture made, I really was thrilled to be at Barnes and Noble. ﻿ Having the opportunity to talk with women, encourage them, and share with them the reason for the hope I have is the best part of being an author and my reason for being in ministry. After the signing, Joy and I embarked on another first for her, a visit to the Parthenon in Nashville. I have not visited there since I was Joy's age or younger, so this was practically a first for me, too. Joy took most of the pictures below. We didn't get a chance to tour the inside because it was after hours and there was an arts & crafts festival going on in Centennial Park. Every now and then a person just needs a good cry. After a stressful weekend, two days of dealing with an annoying problem, and struggling to understand why waiting on God has to be so difficult, I finally reached my breaking point and had a nine-tissue meltdown. I told God about it, too. You should read my journal! Do you ever wonder if God says, "How dare she talk to me that way?" After crying awhile in my coffee (I don't drink beer) and pouring my heart out to God about all the things that were bothering me, I opened up his Word and began reading through my morning devotionals. The following passage from Streams in the Desert could not have more clearly mirrored what I was feeling at that precise moment. Haven't we all, at times, felt as if God has deserted us? If we are honest, the answer to that question is a resounding "yes." We pray and pray for God to bring about an improvement in our circumstances, our child's behavior, or to confirm a specific calling in our lives. But each night as we lay our head on the pillow, we find ourselves still waiting for his answer and wondering what to do in the meantime. As we wait impatiently for God to break his silence, we struggle to find peace in our difficult circumstances. After pouring out my heart to him and reading Spurgeon's words, I came across the following encouragement from today's selection in Sarah Young's devotional, Jesus Calling: "Trust Me and refuse to worry, for I am your Strength and Song. You are feeling wobbly this morning, looking at difficult times looming ahead, measuring them against your own strength. However, they are not today's tasks--or even tomorrow's. So leave them in the future and come home to the present, where you will find Me waiting for you. Since I am your Strength, I can empower you to handle each task as it comes. Because I am your Song, I can give you joy as you work alongside Me." And the winds and waves were calmed by His voice. And a miracle began by the power of His command, 'Peace, be still.'" Jesus still has the power to calm our storms if we will simply be still and know He is God (Psalm 46:10). Sometimes I find myself aggravated with everyone I know. Every little thing they do becomes a big source of irritation to me. As I struggled with a sour attitude this morning, I began praying Scripture over the very people who annoyed me and found, to my delight, that my attitude quickly changed. As I began thinking of the word "scripture", I noticed the same root, script, in the word "prescription." It occurred to me that a prescription is a written word or order given to a pharmacist for a medication needed to heal one's body. Scripture is God's written word to us, which we need to heal our thoughts, attitudes, and hearts. As we read and study his Word and take it into our spirits, much as we would take medications or vitamins into our bodies, we boost our spiritual immune system, fortify our faith, and find strength to face life's difficulties head on. God's Word is full of promises and the power to address every circumstance of life. When we are in need, He promises provision (Luke 6:38). When we are lonely or afraid, he encourages us and promises never to leave nor forsake us (Deuteronomy 31:6). He promises peace when we are anxious about our circumstances (Isaiah 26:3) and forgiveness when we confess and repent of our sins (1 John 1:9). In fact, God's Word is effective in keeping us from sin when we not only read it, but hide it in our hearts and apply it to our lives (Psalm 119:11). If life has you feeling blue or out of sorts, try reading a verse or two of Scripture and call God any time of the day or night! The Great Physician has no answering service, but his Word has all the answers you will ever need. Twice a month when I sit down to pay bills, I find myself dreading the task. Because of foolish financial decisions made years ago, I am forced to be creative in order to pay the bills and still have money to operate my household and feed and clothe my family. The lust for that which I could not afford at the time has borne consequences that still sting today. I wish I could have foreseen the heartbreak of not having enough resources to share with God's people in need or the folly of serving money rather than God. Jesus said, "No man can serve two masters. Either he will hate the one and love the other, or he will be devoted to the one and despise the other. You cannot serve both God and Money" (Luke 16:13). This is indeed a lesson I have learned the hard way. Even though there is never enough money "on paper" to satisfy my creditors and fund all our expenses, God makes sure that every need of our life is met right on time. A gift from a friend or family member, an unexpected side job, or simply a delay of some sort have time and again been God's provision for a specific need. No matter how bleak circumstances may appear, God always proves true to his Word to supply all our needs "according to his glorious riches in Christ Jesus" (Philippians 4:19). Because of his gracious gifts I am able to stay home with my children and minister to others using the gifts he has given me. There is a mountain standing between me and all God has called me to be, and its name is DEBT. With God's help, I know the mountain will either be moved or I will continue to scale it one step at a time until I stand victoriously on top of it rather than be buried by it. I know that one day money will no longer be an object standing in the way of my passion to encourage others with the life-changing truths of God's Word. In God's perfect timing, I believe I will be debt-free and able to pour into others what has been graciously given to me. God's righteous standard demands that we reap the consequences of our sin. How well I know that, where money is concerned! But there is a debt that God cancelled long ago by sacrificing Jesus, his only Son, so that we all might be forgiven and break free from the strongholds of sin. It is a free gift that we can both receive and share with others by simply passing it on. Whether your mountain is money, substance abuse, or simply the desire to control your own destiny, consider the great price paid to purchase your freedom. Don't serve sin; serve Jesus, the One who paid your sin debt. Allow him to move the mountains that hinder you, so you can fulfill his greater purpose for your life. The only thing that makes me feel more lost than not having my daily quiet time is not finding time to write a devotional or post a blog each day. But sometimes life keeps me too busy to sit down and meditate on a passage of Scripture or share something God has been teaching me. You know what? That's okay. God certainly knows the demands of my life because for the most part, he has ordained them. He also knows that there is seldom a day that I won't take at least a few minutes to read my daily devotionals and surrender my day to him in prayer. In the church I attended as a teenager, we had a women's circle called the Mary-Martha Circle. Although I had absolutely no clue what the circle did, I have come to appreciate the name because most days I am neither a Mary nor a Martha; I am a hybrid of both. I live somewhere in between sitting at Jesus' feet during my quiet time and running around like a headless chicken! Can anyone relate? The weather today was absolutely gorgeous! Even though I started off the day tired and succumbed to a late morning nap, I managed to complete a couple of chores before taking my mega-mug of Starbucks Verona (my favorite coffee, in case you were wondering what to get me for Christmas) and a Beth Moore book outside for a delightful hour of reading. "It was the nearest thing to heaven!" (Sorry, but I've been watching "An Affair to Remember" again!) Now here I am, flirting with midnight, writing a blog that is probably meaningless to anyone but me. The next time you feel you are just a little too busy for your own good, I double-dog dare you to pour yourself a cup of coffee, grab a good inspirational book (Good to the Last Drop: Refreshing Inspiration for Homeschool Moms and Other Busy Women, hint hint! ), and have a Mary moment or two. You deserve a break, so treat yourself to something you enjoy for a change. God certainly thinks you're worth it! Today is September 10, 2010. Seventeen years ago I was "great with child," expecting my firstborn. We knew he would be a boy and had already picked out his name. Because of a late November due date, he was also selected by our Music Minister to play the role of Baby Jesus in the Christmas pageant to take place in early December. What an honor that was for us! I still am amused by the conversation I had with my obstetrician during the final weeks of my pregnancy, when we passed the initial due date set for his birth. "Doctor," I informed her, "my son has been selected to be Baby Jesus in our Christmas program this year and we probably should consider inducing labor." We laughed then, but I was greatly relieved that she cooperated and helped the process along. Chris made his theatrical debut at nine days of age, still the youngest Baby Jesus in the history of our church's Christmas pageant. During the 2008-2009 school year I homeschooled Chris and his sister, Joy. Although our days were a mixture of joy and stress, it was an incredible bonding experience for us. When the adolescent hormones kicked in, Chris began to change and lose interest in school. We began to feel the full effects of having a teenager in the house. Having determined that Chris would function better in the structured setting of a classroom, we re-enrolled him in the public school system in 2009. That year was one of tremendous stress for all of us as he navigated the culture of a high school setting, tested the waters and our patience, and struggled to find his way. Because he wanted to catch up and be a junior this fall, Chris opted to forfeit friend time and sleeping late and chose instead to attend summer school. He worked hard, did well academically, and began making some very positive changes. Tomorrow Chris starts his first job. How could seventeen years have passed so quickly? How could we have gone from lazy mornings watching Barney in our pajamas to bagging groceries in just the wink of an eye? I know that he won't be home with us much longer, but I am so proud of the young man he has become. Chris, God has great things in store for you. If you will work hard, play hard, and above all, PRAY HARD, He will guide and direct you, bless and prosper you, and walk with you every step of the way. Do you ever find yourself asking, "Why can't I have just one easy day?" or "Why does life always have to be so difficult?" If you are not asking those questions, then I want to know your secret! We all have hard places, some more than others. Your hard place may be a mountain of debt that seems to grow bigger despite your best efforts to pay it off. Or it may be a friendship that you can no longer figure out, a relationship that has changed for reasons you do not understand, leaving you hurt and bewildered. Perhaps you are following what you know in your heart to be God's will for your life, but you don't see the fruit of your obedience. You thought, somehow, that obeying God would result in an easier walk, not a more difficult one. You emerge with your faith muscles strained, yet strengthened as you exercise them. Keep walking, dear one! When we are caught between a rock and a hard place, it is easy to become filled with doubt. We question how clearly we may have heard God's voice regarding a particular matter or wonder if we took a step in the wrong direction. We second-guess ourselves and sometimes, we even second-guess God. How do find our way out of the confusion and the storm of emotions that crash like waves around us? How can we keep our joy when brokenness is all we know? We have to believe the God we believe in. We have to know his Word and stand on what we know. God tells us that life will be difficult, but he promises his peace (John 16:33); that we are to count it all joy (yes, joy) when we face trials of many kinds because through perseverance we will be made mature and complete, not lacking anything (James 1:2-4); and that he will keep in perfect peace the one whose mind is steadfast, because he trusts in the Lord (Isaiah 26:3). God is bigger than your brokenness. All he asks is that you have faith to believe that he will do what is best for you. Life is a hard place, but you can confidently stand on the Rock of your salvation and know that he is fighting for you (Exodus 14:14). It isn't often than I just fire off a bunch of random thoughts in a blog. Generally I try to write something structured, short, and of some meaning or benefit to someone. But the weather is cloudy today and my brain isn't functioning in a very organized manner. I really don't expect anyone to read or benefit from anything I write here, but I make it available to you if you are even remotely curious. Maybe I'm writing because I feel a little disconnected today. With Facebook, Twitter, email, and a blog, you might wonder how that's even possible. I have spent much of the day by myself (not alone, though, as Jesus is always a comforting presence in my life). The kids are home now and settled into their afternoon routine of snacks, TV, and homework. We are looking forward to a quiet evening at home but haven't yet figured out what to have for dinner. I have had a lot of lengthy conversations with God lately about ministry, writing, and where my life is headed. Having recently finished reading Pathway to Purpose for Women by Katie Brazelton, I am more excited than ever about the possibilities that lie ahead. For the past four and a half years I have been on a journey to find my purpose, and I believe that a speaking and writing ministry is the direction God would have me go. How can I know for sure? How can any of us know for sure except for the peace that He gives us and the passion that burns deep within to do His work? I know that if I am embarking on the path God has chosen for me, He will provide for my every need even if logic says I cannot afford to do this. Ever since I left my full-time ministry position at Central, we have trusted God for His provision for our family. Money has been tight on one salary, but God has met our needs day by day and allowed me the privilege of being home with my kids, writing my books, and encouraging others with my online devotionals. It has been said that when you find something you love, you'll do it for free. It's true -- and I've been doing it for free a long time. What I am doing -- choosing unemployment, watching every penny, praying my family from paycheck to paycheck, publishing a second book, and launching a ministry -- doesn't make sense according to human logic. I know there are those who would criticize me for NOT working, but I know I am right where God wants me to be. He never promised it would be easy, but this has been the most fulfilling and rewarding four and a half years of my life! Every day with Him has been a new adventure, a thrill ride even the meanest roller coaster cannot match, and some days I feel as though I am hanging on for dear life. Yet I know that I am safe in Him and He will never let me go. Don't get me wrong. There are times I have absolutely gotten frustrated with God and tried everything I could do to find employment, consulting work, etc., but He has shut every door I have attempted to go through and continues to say, "Trust Me." One thing I do know, my heart's desire is to positively impact and encourage my sphere of influence with the Word of God, whether through my books, blogs, or at speaking events. I pray that God will open doors to allow that to happen. Please pray that He does. Please let others know my heart. I am not in this alone -- I am counting on God's people to catch the vision God has given me and help me reach our world, one person at a time. No matter what happens, God knows that I am completely His. Whether or not this ministry succeeds is totally His call. But I will not be silent. I will continue to write, share, and live the truths He has given all of us in His Word. Will you join me? Will you surrender yourself wholly to Him and ask Him to reveal His purposes for your life? I promise you, you will be in for the ride of your life! My morning walks are a prelude to my daily quiet time with the Lord. During these walks I usually pray for friends and loved ones or people in need. I seek God's direction for my day and lay out my petitions before him. In short, I do most of the talking, leaving little room for him to get a word in edgewise. This morning's walk was different, though. Rather than rehearse the normal litany of prayer requests, I simply asked what God would have me communicate through my speaking ministry, then listened for his answer. A testimony was the first thing that came to mind, as well as the experiences that have led up to this season of ministry. At that moment I realized that my life is merely an unfinished symphony and that God will continue writing my song until I draw my final breath. Many people think of their lives as a tapestry, full of pleasant experiences and ugly sin woven together by God into a beautiful picture of his grace. Whichever image you might use to describe your life -- a tapestry or an unfinished symphony -- you can rest assured that God is still creating you in his image and will not stop until the last stitch is placed and the last note is written. When we surrender ourselves to God's will, he will compose a beautiful masterpiece that will outlive our mortal existence and be a song of joy for those to follow. As we allow the divine Maestro to direct every measure of our lives, he will put a new song in our mouths, a hymn of praise to our God. Many will see and fear and put their trust in the LORD (Psalm 40:3). As I consider God's call into ministry, I am reminded that the Gospel ministry is not a task for a chosen few; it is something we each are called to do. My heart is burdened to reach those who don't yet know Jesus and to encourage the weary saints who must press on against the evils of this world to live out a victorious and joyful faith in the eyes of a watching world. On this Labor Day I will not rest. While I work on long-neglected projects, I will pray for my loved ones, my lost friends, and for the ministry that God has in store for me. As I pull the weeds from my garden, I will think of the fields "ripe for harvest" (John 4:35), those souls that need the Jesus I know and love. Jane Borthwick penned the following hymn which should become the rally cry for every Christian. Will you join me in laboring for the lost? Words: Jane L. Borth­wick, 1859, 1863. Yard Sale! The mere sight of those words sends chills down my spine. Having a yard sale brings out the worst in me because I become resentful of the time and sleep I inevitably must sacrifice in order to put one together. As a result, our family doesn't have yard sales very often, though it would be a benefit to sell off some of our stuff. As I was preparing for a particular yard sale, I found myself in complaint mode, whining to my husband, kids, and Facebook friends. The thought occurred to me that I might make the most of a bad situation by having a spur-of-the-moment book signing and look for opportunities to encourage those who come rather than remain annoyed by the whole ordeal. As Christ's ambassadors, the next time we are faced with a dreadful task or one that simply requires a little personal sacrifice, let us resolve to be more positive and view it as an opportunity to share his love with others. We need to "be imitators of God, therefore, as dearly loved children and live a life of love, just as Christ loved us and gave himself up for us as a fragrant offering and sacrifice to God" (Ephesians 5:1-2). Lord, forgive me for complaining so much about things that I don't particularly enjoy and look instead for the hidden blessings that you may have in store. I pray that those coming to my yard sale will see and take away not only the junk I have for sale, but also the joy of Jesus who lives in me. Help me, in all situations, to 'speak only what is helpful for building others up according to their needs'" (Ephesians 4:29).